Image courtesy Feminist Mormon Housewives. Had to repost this hilarious graphic. Oh what a difference two letters makes. To compare with the original graphic as appeared in The Friend, check out fMh. Okay, this is really funny. But when I saw the bit about the “woman’s” version actually being in _The_Friend_, wow… that’s disturbing. Oh, yes! You see it, don’t you? I think what you need to keep in mind is that our SOCIETY, in general, has treated women badly over the ages. Treating women differently can be either a good or a bad thing. Good, because as women, we ARE different from men! (Treating women completely and exactly like men, in all circumstances does NOT always equal justice/respect). Obviously it’s wrong, when women are oppressed or abused. (for ex: voting rights, equal pay, domestic violence/abuse or freedom of choice/independence). This treating women differently, as evidenced by this website, is obviously interpreted positively or negatively in a variety of ways. Some women feel that being treated differently by not holding the priesthood means they are viewed as “less than” men- like it’s akin to not being able to vote, or seen as being “told what to do”. While this “less than” belief does prevail sometimes with those who don’t understand truth, that is NOT what the church embraces. Definitely not what a loving God endorses. It’s probably one of the reasons the above statements were published in “The Friend” in the first place. By posting those statements, the church leaders were trying to show APPRECIATION for women, to counter-act abusive ideals the WORLD has embraced in the past, and which SOME church MEMBERS have adopted wrongfully. Adopted not because of scripture, but from wrongful interpretations of it. For example, with priesthood authority, some people fail to pay attention to the last part of D&C. – which has MAJOR implications of how we should be treating not just women, but every human being in our lives. Please, with your above parody, look at yourself to see if you’re having a “darned if you do/darned if you don’t” mentality towards the church. 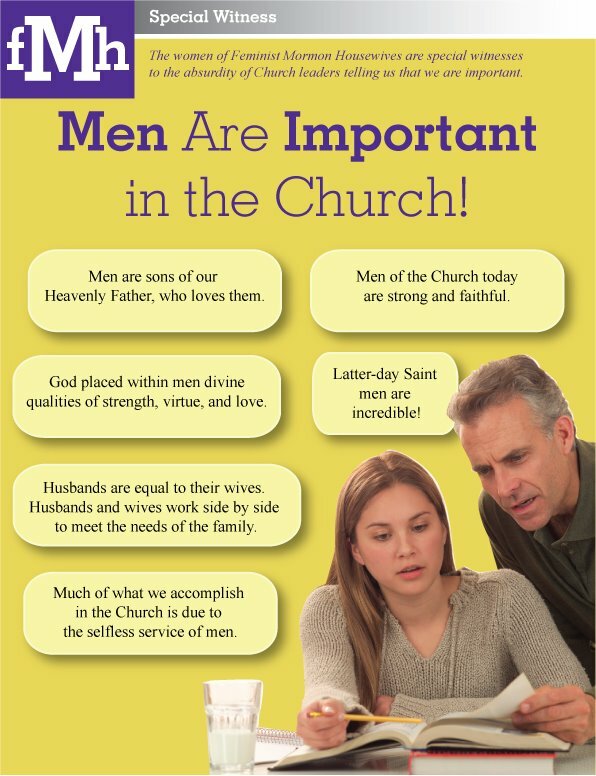 For example, when the church tries to show appreciation for women and their uniqueness, you see it as “patronizing” or “demeaning” because men don’t need affirmations because they’re automatically “valued”. But if the church DOESN’T notice women sufficiently they’re accused of “ignoring women’s rights” and/or “women don’t have a voice” in the church. Can you see how this attitude distracts from truth? The truth being: “The worth of SOULS (not exclusively men, not exclusively women, children included, too) is great in the sight of God”. Please, try to get past solely focusing in on your own womanhood and perceived threats to it. While our womanhood is definitely important, it shouldn’t be the only thing that defines us. Women, men, & children; ALL of us are needed and significant in uplifting, different ways to further the Lord’s work on earth. (see ) Please look at the totality of the big picture of the gospel of Jesus Christ: How we are ALL needed to help things work, and that it’s our differences from each other, not just in our female or maleness, but also our personalities that make our contributions in life significant. Please stop focusing in on a whole variety of little things, (stories in lesson manuals, etc…) and then only interpreting them through feminist lenses. If you want to find something to criticize, you will always find it. It seems like you want to make issues of things, trying to find numerous reasons to feel “mistreated” as a female member of the LDS church. Though baffling, this sort of “humor” is what I have come to expect from FMH and from “feminists” in general, especially those who call themselves LDS. Woah this weblog is excellent i love studying your posts. Keep up the good work! You recognize, many persons are hunting around for this info, you could aid them greatly.